Wireless cycle computers have a distinct advantage of the wired variety. Wires can scrap away at the paint on the bike. They are more prone to breaking. Extra wires can add small aerodynamic drag to bike. Earlier wireless models used to be really bulky and big, but in past few years, improved models have reduced size and improved performance. I use a Cateye Strada and new model is big improvement over earlier ones. 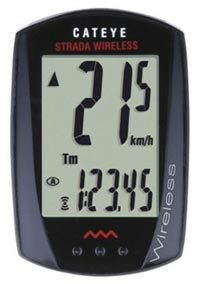 The Wireless Cateye Strada has recently been increased in price quite a bit. However, the latest model is really quite a big improvement on previous model. Cateye have made a computer that is genuinely waterproof (they keep buttons underneath computer in a clever design). Also, the sleek and slender design of both computer and magnet detector make it more visually appealing and more aerodynamic. I have been very pleased with my Cateye Strada (especially as you can choose colours to fit your own road bike) It is very reliable and have not had any problems over past 18 months of using it. The new models are a big improvement on the older versions. The new 2012/13 models I’ve found to be more reliable than some Cateye computers I bought several years ago. 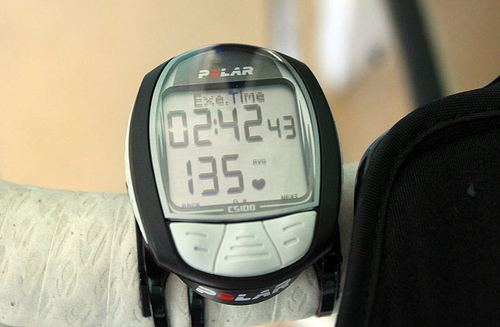 The Polar computer combines its heart rate monitor technology with traditional cycle computer. 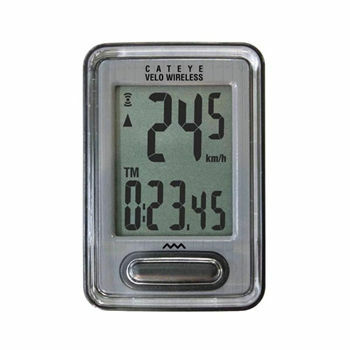 Enabling you to combine the heart rate monitor and computer in one, saves space on your handlebars and integrates the two functions. The Knog Nerd 9 is not the best value cycle computer – it costs £48. But, it is usually the easiest to set up. (However, I did have difficulty on a road bike with unusual shaped forks) It really is ‘wireless’ because it’s innovative design means that you don’t need any wires, ties or screwdrivers to fix. It is so easy to set up you can easily transfer between bikes. It also looks great and comes in range of three different bright colours. See full review of Knog Nerd 9 - The Knog Nerd 12 includes a few extra functions – (automatic scanning of all displays, relative speed gauge) and is a little more expensive. If you are looking for something a bit different, the Knog is good. 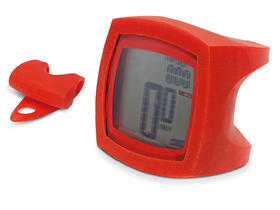 It would make a great Christmas gift for a keen cyclist. 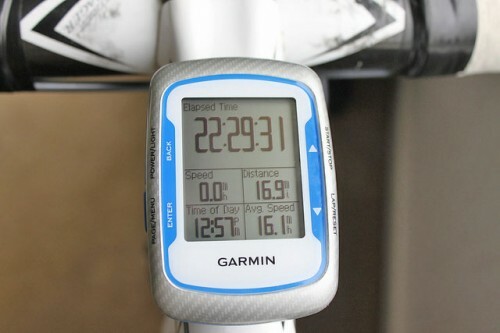 The Garmin Edge really takes things to the next level. Rather than £20-£30. You are paying £120 – £200 (depending on the model). However, I decided to purchase a Garmin 500, and never regretted it. The Garmin edge gives you every bit of statistics analysis you could want. Elevation, gradient of the climb, total amount of climbing. Then you can easily upload to Garmin or Strava to check how you got on the ride. It is wonderfully designed and looks sleak on your bike (and only weighs 65 grams). It is also very easy to fix. Needing no tools at all! It needs recharging more frequently after a couple of long rides. There have been times when unwittingly the power was left on leaving it empty at the start of the ride. But, on the plus side, you don’t have to buy batteries. Look at the Mavic Wintech Ultimate wireless unit – this has it all just a little complicated to set up and pair the units – I still need help with pairing but it is a super unit although not cheap. One odd point – you wear the cadence unit like an ankle tag – prisoner to cycling? © 2014 Cycling Review. All Rights Reserved.